The Florida Data Science for Social Good (FL-DSSG) Program is a summer internship program that matches data science expertise with real-world problems. The FL-DSSG program works with community organizations who are trying to affect change in their communities and who have data management, analysis, and data visualization projects that have the potential to shift understanding around a community issue, influence planning, revise practices, or see efforts in supporting community initiatives more focused or renewed. 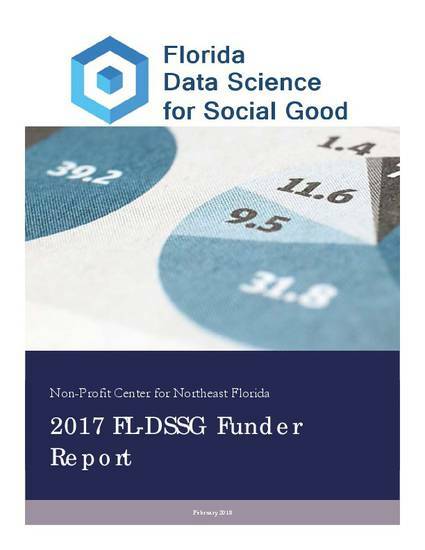 The mission of the FL-DSSG is to promote data-informed approaches and partners and the partners who use these approaches solve wicked social problems while creating educational programs for aspiring data scientists. Three non-profit organizations participated in the 2017 program: Changing Homelessness, Mayo Clinic Wellness Rx, and Yoga4Change. The Changing Homelessness project included building profiles of individuals who visited homeless shelters in the Northeast Florida region. DSSG Interns developed a “dignity index” used to identify individuals who are in need of rapid rehousing. The Mayo Clinic project involved creating a data-driven decision tool to support community health program selection and coordination in Duval County. DSSG Interns developed a Tableau dashboard that allowed Mayo Clinic Wellness Rx to compare and contrast neighborhoods based on health disparities and community assets. The Yoga4Change project focused on determining whether trauma-informed yoga practices produced intended results. DSSG Interns’ analysis revealed that Yoga4Change participants experience dramatic improvements in blood pressure and mood as well as reductions in stress levels.